Lloyd, Birchler and Perry developed a multimedia prototype of a virtual reality application for the NCA (National Center on Accessibility). The application would allow participants to explore issues of accessibility within public parks and recreation areas. 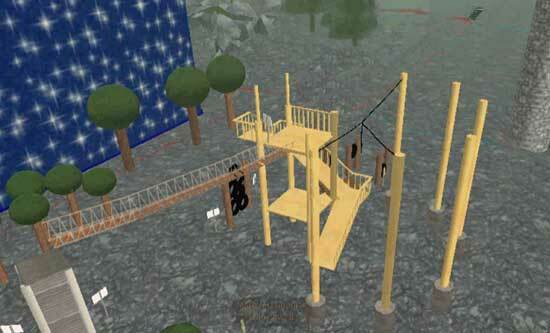 The used Second Life and Machinima to create the prototype for an application that would teach parks and recreation employees about issues of accessibility through the development and evaluation of virtual . One part of the application would require participants to complete job-specific tasks, such as an architect being asked to redesign the width and slope of a virtual ramp so that it meets federal accessibility requirements. The other portion of the program would have users’ avatars – which may or may not have disabilities – traverse the virtual challenge course either alone or with others who are logged into the web-based program at the same time. This entry was posted in accessible, Experience Disability, prototyping, virtual reality. Bookmark the permalink.